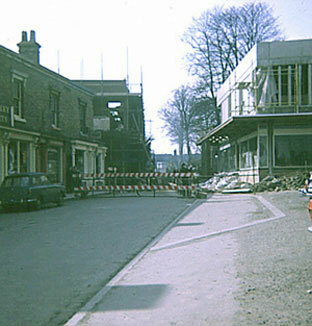 This photo, from a set of slides recently loaned to the Study Group by a local resident, shows the destruction that took place in the heart of Madeley in 1968 and ’69. 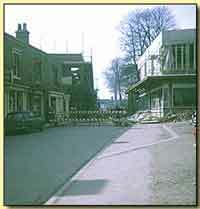 The picture was taken from outside the present day Co-op food store, looking west along Park venue toward Russell Square, which can be seen taking shape behind the striped barriers. The Anstice Memorial Institute (just out of picture, right foreground) and the chestnut tree (visible over the top of the library, top right) are all that remains of the attractive old shopping area. More pictures from this collection can be found elsewhere in this article. The events described below happened around 50 years ago — well within living memory. To many people living locally, this memory is clear, painful and liable to arouse anger. Most of the sources are contemporary with the events — news items and articles from the then local weekly newspaper, The Dawley Observer, official reports from the Dawley, later Telford Development Corporation endorsed by the official history of the New Town, written by Maurice de Soissons in 1991. Other sources are the words and memories of Madeley people as recorded in ‘The Madeley Book’, which was also published in 1991 and as collected now. The research was carried out by members of the Madeley Local Studies Group using the resources of Madeley Library, and edited by Marilyn Higson,Madeley Librarian, a member of the Local Studies Group. It was first presented to the public as a reading at the Madeley History Day in March 1998. Dawley New Town, the predecessor of Telford, was designated in 1963. Dawley had been attracting overspill population from Birmingham for some time and the creation of a new town was seen as a dynamic way of coping with the new population and providing houses and jobs in rural surroundings. It would also provide the opportunity to reclaim and develop land made derelict by its industrial past — to create a pleasant city from the moon landscape of the Industrial Revolution. It was hoped that with all the goodwill, promises of aid and available experience that the New Town in Shropshire would be developed as quickly as possible but avoiding the mistakes of the past while incorporating all the successful ideas from existing new towns. The initial plans drawn up by the John Madin Partnership met with general approval. An ultimate population of 90,000 was to be aimed for which would be made up from 50,000 newcomers from the West Midlands, 20,000 existing population and 20,000 from natural increase. A city of this size would dominate Shropshire commercially but it was also argued that the ultimate population should be allowed to increase to 150,000 in order to make a wider range of cultural and educational facilities more viable and to challenge the collateral pull of Wolverhampton and Birmingham. The terrain of the area would not allow centralised development as had occurred at previous new towns. The plan was to create the new town around community centres, larger centres to serve groups of communities and eventually a main new town centre. So the Development Corporation set about dividing the whole area into nine servicing areas/residential units, each designed to have a population of about 8,000. At this size and density, no dwelling should be more than a third of a mile from the servicing centre but such a population could support a satisfactory local shopping centre, medical practices, community building, church or church hall, pub and two primary schools. These units would be circled by perimeter roads leading to larger local centres. Much of the area to be developed was land that needed to be cleared and have all the basic services provided. It was estimated that 41% of the designated area had pit shafts and heaps, soil disturbances caused by shallow mining and clay extraction. One of the first necessities was the provision of adequate sewage and drainage facilities. The existing small communities all lay within the drainage area of the River Severn but were administered by four local authorities with no cohesive drainage system. So the first major job for Dawley Development Corporation was the creation of a major sewage disposal works near the River Severn. Negotiations for the Gitchfield site commenced in 1964, but the sewage works there only came into operation in 1967.